To date, there is no definitive approach to map snow depth in mountainous areas from spaceborne sensors. We used very-high-resolution stereo satellites imagery (Pléiades) to generate a map of snow depth in a small Pyrenean catchment. The validation results are promising and open the possibility to retrieve the snow depth at a metric horizontal resolution in remote mountainous areas, even when no field data are available. We examine the development and drainage of subglacial lakes in the Antarctic using a finite element hydrology model. Model outputs show development of slow-moving pressure waves initiated from water funneled from a large catchment into the ice stream. Lake drainage occurs due to downstream channel formation and changing system hydraulic gradients. These model outputs have implications for understanding controls on ice stream dynamics. In this study we investigate the impact of strong variability in snow accumulation during 2 subsequent years (2013–2014) on the land–atmosphere interactions and surface energy exchange in two high-Arctic tundra ecosystems (wet fen and dry heath) in Zackenberg, Northeast Greenland. We observe that the energy balance during the snowmelt periods and growing seasons was strongly regulated by the availability of snow meltwater, with strong impact on the overall ecosystem performance. Our study aimed to investigate whether CS-2 and Envisat radar freeboard can be merged without intermission biases in order to obtain a 20-year data set. The comparison revealed a reasonable regional agreement between radar freeboards derived from both sensors. Differences are mostly below 0.1 m for modal freeboard and even less for mean freeboard over winter months (May–October). The highest differences occur in regions with multi-year sea ice and along the coasts. We identified 12-year cyclic surging episodes at Donjek Glacier in Yukon, Canada. The surging area is limited within the ~20km section from the terminus, originating in an area where the flow width significantly narrows downstream. Our results suggest strong control of the valley constriction on the surge dynamics. This contribution shows that the surface area variations of unconnected glacial ponds, i.e. ponds not directly connected to glacier ice, can be considered as suitable proxies for detecting past changes in the main hydrological components of the water balance (glacier melt, precipitation, evaporation) on the south side of Mt Everest. How fast does permafrost warm up and thaw after it is covered by the sea? Ice-rich permafrost in the Laptev Sea, Siberia, is rapidly eroded by warm air and waves. We used a floating electrical technique to measure the depth of permafrost thaw below the sea, and compared it to 60 years of coastline retreat and permafrost depths from drilling 30 years ago. Thaw is rapid right after flooding of the land and slows over time. The depth of permafrost is related to how fast the coast retreats. The Canadian Ice Service record of observed landfast ice and snow thickness represents one of the longest in the Arctic that spans over 5 decades. We analyze this record to report on long-term trends and variability of ice and snow thickness within the Canadian Arctic Archipelago (CAA). Results indicate a thinning of ice at several sites in the CAA. State-of-the-art climate models still have difficultly capturing observed ice thickness values in the CAA and should be used with caution. We study how well the basal geothermal heat flux can be inferred from surface velocity observations using a thermomechanically coupled nonlinear Stokes ice sheet model. The prospects and limitations of this inversion is studied in two and three dimensional model problems. We also argue that a one-way coupled approach for the adjoint equations motivated by staggered solvers for forward multiphysics problems can lead to an incorrect gradient and premature termination of the optimization iteration. A cost-effective automatic laser scan has been built to measure snow depth spatio-temporal variations. Deployed in the Alps and in Dome C (Antarctica), two devices acquired daily scans covering a surface area of 100–150 m2. The precision and long-term stability of the measurements are about 1 cm and the accuracy is better than 5 cm. These high performances are particularly suited at Dome C, where it was possible to reveal that most of the accumulation in the year 2015 stems from a single event. 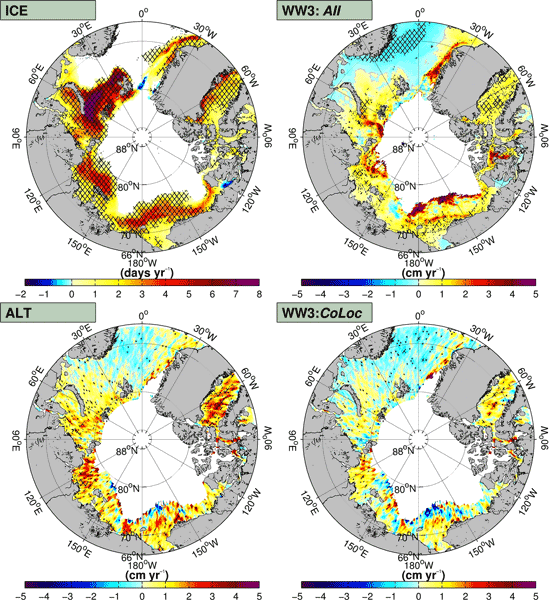 Due to the increasing activity in Arctic, sea-ice–ocean models are now frequently used to produce operational forecasts, for oil spill trajectory modelling and to assist in offshore operations planning. In this study we evaluate the performance of two models with respect to their capability to reproduce observed sea ice diffusion properties by using metrics based on Lagrangian statistics. This paper presents a new and useful evaluation metric for current coupled sea ice–ocean models. In this work, we introduced a parameter ("CP ratio") for the retrieval of the thickness of undeformed first-year sea ice that is specifically adapted to compact polarimetric SAR images. Based on a validation using other compact polarimetric SAR images from the Labrador Sea, we found a root mean square error of 8 cm and a maximum correlation coefficient of 0.94 for the retrieval procedure when applying it to level ice between 0.1 m and 0.8 m thick. Ice penetrating radar enables determination of the basal properties of ice sheets. Existing algorithms assume stationarity in the attenuation rate, which is not justifiable at an ice sheet scale. We introduce the first ice-sheet-wide algorithm for radar attenuation that incorporates spatial variability, using the temperature field from a numerical model as an initial guess. The study is a step toward ice-sheet-wide data products for basal properties and evaluation of model temperature fields. Simulations are carried out in the Pyrenees with the snowpack model Crocus, driven by meteorological forecasts from the model AROME at kilometer resolution. The evaluation is done with ground-based measurements, satellite data and reference simulations. Studying daily snow depth variations allows to separate different physical processes affecting the snowpack. We show the benefits of AROME kilometric resolution and dynamical behavior in terms of snowpack spatial variability in a mountain range. Using a 9-year dataset in conjunction with a process-based model, we verify that the common assumption of a considerably smaller thermal conductivity in the thawed season than the frozen season is not valid at a site with a stratified active layer on the Qinghai–Tibet Plateau (QTP). The unique hydraulic and thermal mechanism in the active layer challenges the concept of thermal offset used in conceptual permafrost models and hints at the reason for rapid permafrost warming on the QTP. Satellite observations show the Arctic sea ice has decreased the last 30 years. From our wave model hindcast and satellite altimeter datasets we observe profound increasing wave heights, which are caused by the loss of sea ice and not the driving winds. If ice-free conditions persist later into fall, then regions like the Beaufort–Chukchi Sea will be prone to developing larger waves since the driving winds are strong this time of year. We examine if a potential "tipping point" in Arctic sea ice, causing abrupt and irreversible sea-ice loss, could be foreseen with statistical early warning signals. We assess this idea by using several models of different complexity. We find robust and consistent trends in variability that are not specific to the existence of a tipping point. While this makes an early warning impossible, it allows to estimate sea-ice variability from only short observational records or reconstructions. We present successful continuous measurements of water vapor isotopes performed in Antarctica in January 2013. The interest is to understand the impact of the water vapor isotopic composition on the near-surface snow isotopes. Our study reveals a diurnal cycle in the snow isotopic composition in phase with the vapor. This finding suggests fractionation during the sublimation of the ice, which has an important consequence on the interpretation of water isotope variations in ice cores. We present a new rock outcrop map for the entire Antarctic continent, a principal base dataset for research and mapping in Antarctica with broad applications. To derive the map, a new methodology was developed and applied to allow automated identification of rock outcrops from Landsat 8 satellite images whilst excluding sunlit and shaded snow, clouds and liquid water – the first such automated methodology. The new dataset reveals that exposed rock forms only 0.18 % of the entire continent. We demonstrate that snow accumulation rates across the Greenland Ice Sheet, determined from RADAR layers and modeled snow density profiles, are identical to ground-based measurements of snow accumulation. Three regional climate models underestimate snow accumulation compared to RADAR layer estimates. Using RADAR increases spatial coverage and improves accuracy of snow accumulation estimates. Incorporating our results into climate models may reduce uncertainty of sea-level rise estimates. This paper highlights results from a 2014 airborne laser altimetry campaign over Alaskan glaciers. The study was conducted in support of a NASA satellite mission (ICESat-2, scheduled to launch in 2017). The study indicates that the planned beam configuration for ICESat-2 is ideal for determining local slope, which is critical for the determination of ice-sheet elevation change. Results also suggest that ICESat-2 will contribute significantly to glacier studies in the mid-latitudes. The winter snow insulation is a key process for air–soil temperature coupling and is relevant for permafrost simulations. Differences in simulated air–soil temperature relationships and their modulation by climate conditions are found to be related to the snow model physics. Generally, models with better performance apply multilayer snow schemes. Contemporary climate warming over the Arctic is accelerating mass loss from the Greenland Ice Sheet through increasing surface melt, emphasizing the need to closely monitor surface mass balance in order to improve sea-level rise predictions. 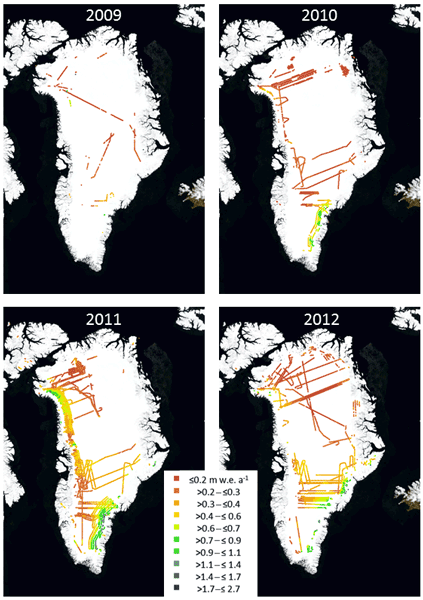 Here, we quantify the net annual accumulation over the Greenland Ice Sheet, which comprises the largest component of surface mass balance, at a higher spatial resolution than currently available using high-resolution, airborne-radar data. Four years of anisotropy measurements of seasonal snow are presented in the paper. The anisotropy was measured every 4 h with a ground-based polarimetric radar. An electromagnetic model has been developed to measured the anisotropy with radar instruments from ground and from space. The anisotropic permittivity was derived with Maxwell–Garnett-type mixing formulas which are shown to be equivalent to series expansions of the permittivity tensor based on spatial correlation function of snow. In recent decades, the Greenland Ice Sheet has been losing mass and has thereby contributed to global sea-level rise. Here we derive the basic equations for the melt elevation feedback that can lead to self-amplifying melt of the Greenland Ice Sheet and ice sheets in general. The theory unifies the results of complex models when the feedback dominates the dynamics and it allows us to estimate the melt time of ice sheets from data in cases where ice dynamic loss can be neglected. Early 21st century changes in the extent of glaciers on Kamchatka were manually mapped from satellite imagery. This revealed 673 glaciers, with a total surface area of 775.7 ± 27.9 km2 in 2000, and 738 glaciers, with a total area of 592.9 ± 20.4 km2 in 2014. This ~24 % decline in glacier surface area is considered to reflect variations in climate (particularly rising summer temperatures), though the response of individual glaciers was likely modulated by other (non-climatic) factors. Sea ice variability within the marginal ice zone and polynyas plays an important role for phytoplankton productivity and krill abundance. Therefore mapping their spatial extent as well as seasonal and interannual variability is essential for understanding how current and future changes in these biologically active regions may impact the Antarctic marine ecosystem. Assessments are complicated, however, by which sea ice algorithm is used, with impacts on interpretations on seabird populations. Approximately 25 % of the glacierized area in the Everest region is covered by debris, yet the surface mass balance of these glaciers has not been measured directly. From terrestrial photogrammetry and unmanned aerial vehicle (UAV) methods, this study shows that the ablation is strongly reduced by the debris cover. The insulating effect of the debris cover has a larger effect on total mass loss than the enhanced ice ablation due to supraglacial ponds and exposed ice cliffs. The hydroclimatological model AMUNDSEN is set up to simulate snow and ice accumulation, ablation, and runoff for a study region in the Ötztal Alps (Austria) in the period 1997–2013. A new validation concept is introduced and demonstrated by evaluating the model performance using several independent data sets, e.g. snow depth measurements, satellite-derived snow maps, lidar data, glacier mass balances, and runoff measurements. Portions of the Antarctic Ice Sheet edge that rest on upward-sloping beds have the potential to collapse irreversibly and raise global sea level. Using a numerical model, we show that changes in the slipperiness of sediments beneath fast-flowing ice streams can cause them to persist on upward-sloping beds for hundreds to thousands of years before reversing direction. This type of behavior is important to consider as a possibility when interpreting observations of ongoing ice sheet change.